I spend last weeks a lot of time. And now most parts works. Marlin4Due works with RADDS (also the RADDS-Display with the Back-Button) and also should work with RAMPS-FD V1/V2 (but not tested!). All the extras which are new in the main-fork are implemented in Marlin4Due. Many thanks to bobc for a great starting point! Also many thanks to all Marlin-developers! Many thanks for your good work. I'll be testing Marlin4Due in a few days, as soon as I get the couple of Due boards I have ordered (they are in the mail right now). I'll report back in this thread. Which shield do you want to use? You could then also try to resolder some 1k ohm instead of 4k7 for the thermistors. There are allready some temperature-tables for 1k pullups. This should make high temperatures much more stable, because the 3.3v are not that much for the ADC. And the mailman just delivered the Due, so I should be testing your firmware very soon! Bad idea. The SAM3X8E processor used in the Due has rather high ADC offset voltages. The resistors used on Duet electronics were originally 1K, but quite a few boards had to be replaced because the offset voltages were so high (but within the MCU specifications) that at room temperature the firmware could not tell the difference between a disconnected thermistor and room temperature. Duet electronics now uses 4K7 series resistors. Why is Marlin4Due still using thermistor tables? Other 32-bit firmwares can handle any thermistor, all you need to provide are the [email protected] and B values. Edited 1 time(s). Last edit at 03/20/2015 11:10AM by dc42. OK, I downloaded the zip file for Marlin4Due from GitHub and extracted it, and installed the Arduino IDE version 1.6.1 on my Ubuntu 14.04 Linux box. I then launched the new Arduino IDE, opened the Marlin.ino file, and proceeded to verify that it compiles fine, which it does. I have just downloaded the compiled file to the Due using the programming port, and that too went fine. Question: do I now have to switch the USB cable to the native port to use the Due as a printer controller? I believe Marlin uses tables for the thermistors simply because it's faster than calculating values, and the tables do not take a lot of space in flash. Recv: First start for temperature finished. Obviously the temperature reading are incorrect, etc... This was just a test to see if the communications part of the firmware was working, and indeed it is working. That may be a valid reason for firmware that has to live with the limited calculation speeds of an 8-bit processor as in Marlin for Arduino Mega/RAMPS, but IMO it's a silly thing to do on a 32-bit processor, because it means that in order to support a new thermistor type, you have to construct a new table. 32-bit processors have more than enough power not to need tables. // 13 is 100k Hisens 3950  1% up to 300°C for hotend "Simple ONE " & "Hotend "All In ONE"
Well, sure it could calculate it. But helps this with accuracy? I port that part only and it works perfectly. Also, you have problems with room temperature? Did you ever print at 270°C or ~0.1V ADC? 3.3V aren't much for high temps. New Question please: can I get higher baud rates than 250 000 baud if I switch to the native USB port to connect the Due to the PC? Edited 1 time(s). Last edit at 03/20/2015 05:45PM by AndrewBCN. The SAM3X processor in the Due has a 12-bit ADC, compared with the 10-bit ADC of the atmega2560, so it is capable of better resolution at high and low temperatures. Some time ago I calculated that the ideal series resistor for 3D printer electronics would be about 3.3K, based on a temperature range of 0C to 300C, and suggested this to RepRapPro (who commissioned the Duet electronics design). So the 4.7K they chose to switch to is IMO higher than optimum. If you have the thermistor ground connected to analog ground (not shared ground), and the series resistor connected to the analog reference voltage, it makes no difference whether you are using 3.3V or 5V. 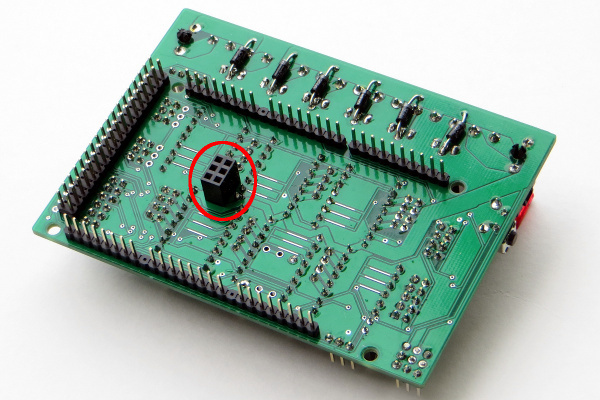 Unfortunately, the Arduino Due (like all the other Arduinos) was evidently not designed by professional electronics engineers, because it fails to provide a separate analog ground pin. The Arduino team has had years to learn this lesson, but have failed to do so. Nevertheless, by dedicating one of the several Arduino Due ground pins to serve as analog ground, you can get close to that ideal. Aref is no option on the Due as you know. If I'm right, RADDS use the ground pins. But I'm not the right man to dispute. I start with bobc/Marlin and port the complete new code from 8bit and makes some modifications, so Marlin, as you had said just is an 8bit system, runs now top at high speed. You are probably aware that Marlin4Due is a port of Marlin, which has been developed until now on the 8-bit AVR architecture. So it would be quite annoying and would really pollute this thread if you keep posting such remarks as "... but IMO it's a silly thing to do on a 32-bit processor..." and keep comparing Marlin4Due on RAMPS-FD/RADDS/hacked RAMPS 1.4 to RepRapPro firmware on Duet. Let's think positive here, if you want to contribute some code I am certain that you know already how to fork the code on GitHub and make some pull requests. Or keep working on your code for the RepRapPro firmware, I'll be sure to give it a try in a few months time. I added a pins.h file for the hacked RAMPS 1.4 board, and edited a couple of files as well as Configuration.h. I am attaching the modified files to this post. I reflashed the Arduino with the new firmware and I am now able to connect to it with OctoPrint and the temperature readings are correct on the two thermistors which I have temporarily hooked to the board, and I checked that they indeed respond to temperature changes by holding each thermistor between my fingers. Next step is to connect a 12V supply and test one of the steppers. Oh, and also a Graphics LCD. In case anybody is curious about the hacks, they are really simple, I have posted details and pictures in the Electronics/RAMPS subforum. One more thing: apparently the SD card reader on the LCD Graphics controller uses a few pins from the Mega2560 which are not connected in the Due, if anybody knows more about this I would appreciate some hints about what to do. in dogm_lcd_implementation.h, this include fails: #include "dogm_font_data_ISO10646_1_Marlin.h"
It seems this file is generated by a Windows batch file in the /fonts directory, and that creates a dependency on Marlin4Due being compiled in Windows, whereas I believe standard Marlin can be compiled on any OS? Maybe I deleted to much. Just brought back the u8glib. Contrast was really bad so I had to adjust the trimpot all the way, but... it's working! The backlight is a little bit dim because of the 3.3V supply, but it works, so I quite happy with that too. The kill switch also works, however the rotary encoder and the buzzer are not working (yet). The SD card reader would require some extra wires coming directly from the Due and I don't print from the SD card anyways, so I am not going to implement or test it. I disabled SD card support in the configuration but had to make a number of small changes to ultralcd.cpp to get the conditional compilation fixed. I am including both files. Next step is to get the rotary encoder and buzzer working, then another go at the Graphics LCD. For your info: "Note: use hardware SPI only, soft SPI not supported"
while I'm visiting your pins_RAMPS.h. Sorry, I forgot to upload the updated pins_RAMPS_14_HACKED.h. Here it is. SPI is used by Marlin to access the SD card reader on the LCD Controller board, however unfortunately the standard RAMPS 1.4 avoids using the ICSP header which sits smack in the middle of most Arduinos, it uses the MEGA2560 pins 50 to 53 for this. The Due does not. So to use hardware SPI in the Due I would have to install an extra connector sandwiched between the Due and the RAMPS, and I am thinking that since I rarely if ever use the SD card on my printers (I use OctoPrint), it's just not worth the trouble. I may investigate a software SPI implementation later, but at this stage I have simply disabled SD card support in Configuration.h (by commenting out #define SDSUPPORT). I was one of those guys that didn't read the reviews before buying a Ramps-FD V1 RevA. Now that I have one ,along with an Arduino Due, I would like to see how I can help others in the same boat. Wurstnase I will upload your Marlin4Due Firmware and try it out. Is there anything I need to consider on the hardware part of this board before I load the firmware? Yes, please check the inverted heater. This should work now, but maybe I miss something. So please upload the firmware without power of your power supply and check this first. Also there is no EEPROM on RAMPS-FD if I'm right. This will be the next part for Marlin4Due but I need some time to rewrite this part to use the flash instead. You can also use #define SDSS 4 as this is the microsd-slot from the Due. Any known problems with the delta configs? I pulled this down and can build the default config cleanly, but the delta configs (from examples) fail with undefined symbols, IIRC, mainly centered on Z_DIR_PIN, although the X and Y equivalents do not error. I'm going to dig into it, but figured I'd ask first in case this might be known due to a recent change. I can post the detailed error if desired, but not on that system at the moment . . .
OK, got that worked through . . . the example*/deltas/Configuration*.h files are definitly not for this version, or viable as they sit, despite the relatively recent update as per git. The above problem was corrected by correcting the omission of "Conditionals.h" from "Configuration_adv.h". The next issue is a missing definition of a z axis offset, that is normally set with auto bed levelling, and which is apparently mishandled when that is undefined. Defining levelling then throws errors from SanityCheck that no Z limit is set . . . .
Getting there, and hopefully this helps. I note that the baseline configs are labelled as for Marlin 1.3, and these are 1.2 . . . does this port run clean 1.3 config files, or have other changes been made? IE, would finding a set of co fig files for a delta on1.3 be a shorter path to a viable config? Looks like I may be good to go! I pulled example_configurations from the current mainstream GIT, and got the 1.3 dev delta configs. The only thing that was unreferenced in the Marlin4due port was "MEDIAN_COUNT" in Configuration_adv.h, which I added, and now have a delta config that compiles cleanly! Next, to try to put my config in and see if it still compiles! But at least I have a good start! Also, I suggest that the delta sample configs in the Marlin4due GIT branch be updated . . . What's there now is not usable . . .
Last update - config is in, builds cleanly . . . Now I justs need to get hardware since I know it builds, and test for real . . . Hopefully, I'll have the Due tomorrow, and need to order the RAMPS-FD . . .
Looks good so far, though . . . Hopeful for use on my Kossel . . .